In this post we are going to create a custom Administration Page and deploy it into the Application Management section of the Central Administration site. 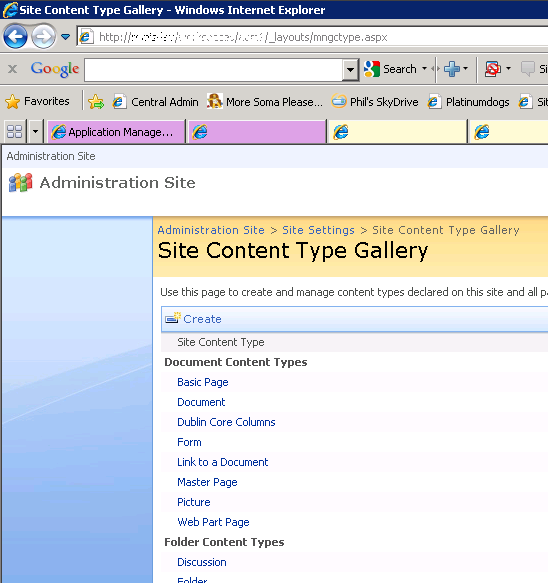 An administration page such as this is classed as a SharePoint application page and developing a custom administration page differs only slightly from developing a custom application page which you might deploy at a site collection or web level, such as the Site Content Types page (mngctype.aspx). A Farm scoped feature which creates a custom action group and custom action in the Application Management page of the Central Administration site. The custom action links the user to the administration page. First add a reference to the Microsoft.SharePoint.ApplicationPages.Administration.dll assembly which can be found in the 12 hive at C:\Program Files\Common Files\Microsoft Shared\Web Server Extensions\12\CONFIG\ADMINBIN. Next create a new public C# class which derives from GlobalAdminPageBase in the Microsoft.SharePoint.ApplicationPages namespace, this class will be the ASPX page’s code-behind class. For more information on SharePoint Central Administration pages, see this article in MSDN. In your solution add a new text file, and rename it as an ASPX file, e.g. mytestadministrationpage.aspx. Add the markup required to create the administration page user interface, the markup below shows a simple administration page with WebApplicationSelector and InputFormTextBox controls. Inherits="Test.Administration.Page.SharePoint.Definitions.ApplicationPages.mytestadministrationpage, Test.Administration.Page, Version=1.0.0.0, Culture=neutral, PublicKeyToken=9960cf7ddc263f39"
Manage configuration settings which are scoped at the web Application level. ErrorMessage="You must enter a valid URL!" The Inherits attribute is used to identify the page’s code-behind and is shown using the fully qualified type name. 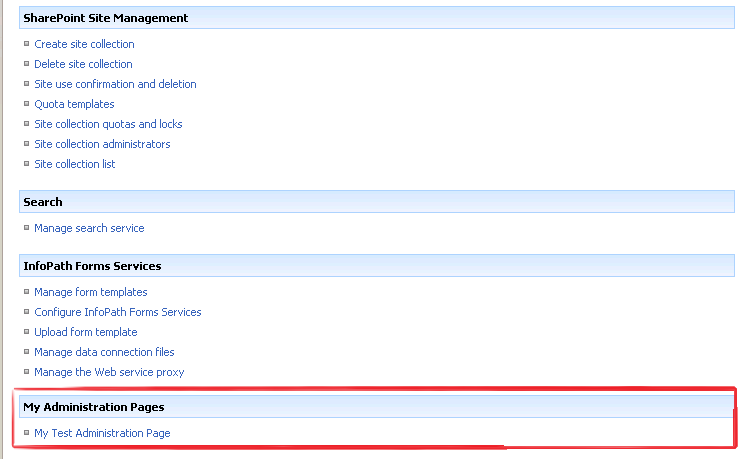 The MasterPageFile attribute is set to use the Administration master page. The AutoEventWireup attribute is set to true. Next we’ll populate the code behind file, in this example we will react to the Context Changed event of the web application selector control. In Page_Load, we hook up the control event handlers and set a default for the single text box control. In the web application selectors Context Changed event handler, we set a couple of controls to the value of the selected web application’s Name and Url properties. Title="My Test Administration Page Feature"
Description="Deploys the Test Administration Page into Central Administration." Inside the element manifest file we create a CustomActionGroup, give it a unique ID and associate it with the Application Management page. We then create a new CustomAction, associate it with the custom action group (using the GroupId attribute) and give a unique ID, Title and associate it with the Application Management page using the Location attribute. Build and deploy the solution to your SharePoint farm. Restart IIS and then go to the Central Administration site. The project zip file for this solution can be found on my projects page. Do you know if I can create a way to logged changes that are made to the Site Collection Administrators via powershell and STSADM. Also, is there someway of preventing users from being able to use Powershell and STSADM to make changes to the Site Collection Admin and web application policy. In SharePoint 2010.